This is a free program or a virtual globe that was initially called as Earth Viewer 3D created by keyhole, Inc. This allows you to fly over virtual globe and view 3D images of earth through high resolution graphics and satellite images. To download Google earth click here. You can explore Google earth in three ways; Desktop, web and mobile. You can use this tool to find your desired location, addresses either locally or globally. You can also use this tool to explore city, state, or country. Google Maps is a desktop web mapping service developed by Google. It offers 360 degree street view, real time traffic situation based on Google Traffic, satellite imagery, street maps, and route planning by foot, cars, bicycle, or any public transportation. You can use Google Maps to get appropriate direction while travelling. This is multilingual language translation tool developed by Google to translate text, images, speech, sites, or real time video from one language to another. You can use this service while travelling in a different region around the world. Use this tool to translate menus, language, regularly used worlds, that will help you for better conversation. 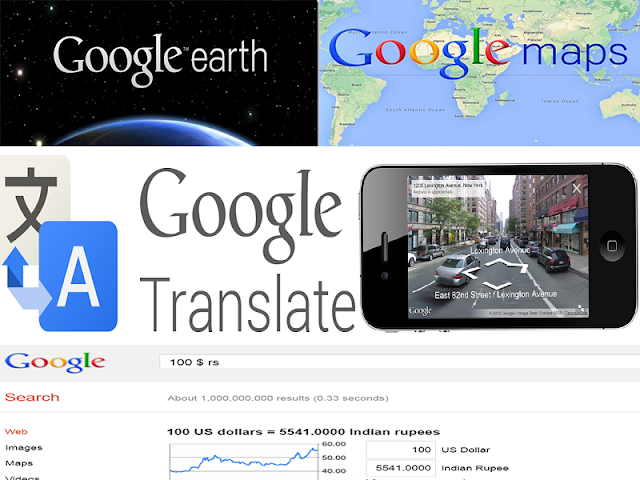 Google Translate supports 103 languages. This service comes in three variations Android version, iOS version, and API. Google Mobile Maps is mobile mapping application developed by Google for Android and iOS platform and others. Using mobile Maps, you can view maps, get directions from source to destination. You can find the routes for walk, for cars, or for metro. Maps are not included in the installed Google Maps for Android in your smart phone. In Android phone to access Google Maps you should need to be connected with internet. Google Maps automatically gets your current location and show in the map. Maps are available for Android, iOS, PlayStation Vita system software, Windows mobile, Symbian OS, BlackBerry OS, Palm OS, and Palm webOS. If you want to exchange currency in any other then you can use this tool to check currency rates and conversion. Soon Google is going to launch a new app Google Trip that will help a lot for travelers.